The Love between A Mother & Daughter is Forever - BEFFY Floating Living Memory Locket Necklace with Charms. Why Buy Gift from us? ◆ Express Your Love - BEFFY fashion locket pendant necklace come with two exclusive plate with meaningful love messages of "My Little Girl Yesterday, My Friend, Today, My Daughter Forever" and "My Daughter, Together We Laugh, We Dream, We Love With All Our Hearts", Express your love for Daughter with this heartfelt fashion pendant necklace. It's a special gift that she will keep forever. ◆ Ideal Gift Choice - A full set of Floating Living Memory Charms Locket Pendant Necklace in an elegant jewelry gift box come with a lucky greeting card. Perfect Christmas Gift, New Year Gift, Anniversary Day Gift, Thanksgiving Day Gift and Birthday Gift and gift for other Memory Time, Wedding, Party, Daily Basis, Family celebrations and get-togethers, and special occasions. ◆ Easy DIY - Each locket is magnetic closure, easy to open and close. 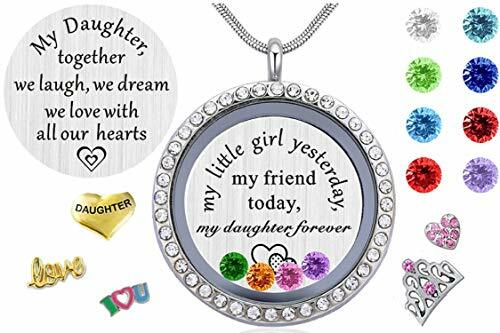 Clear glass double sided face locket opens more than 90 degree angle easier to add image, photo, crystal, floating charms, picture and plate to create a personalized necklace that is a perfect gift for Daughter! ◆ Better Experience - BEFFY Jewelry engage in improving from comfortable wearing, eco-friendly materials to premium packages and devote to surprise user experience. - Store your jewelries separately in a gift box or sealed bag. - Keep it dry and away from chemicals, sweat, bath, and Avoid friction and hard objects to avoid scratching. - Rub your Jewelry with a clean soft cloth after wearing, ensure that your jewelry is completely dry before storage. -- Not for children under 3 year old. ★ DESIGN CONCEPT: The Love between A Mother & Daughter is Forever. BEFFY Memory Locket Pendant Necklace with Charms - The perfect daughter necklace to express your love and care for your awesome daughter. ★ QUALITY and COMFORTABLE COME FIRST: Top quality Stainless Steel metal locket pendant and snake chain, Non Allergic, Non Fade, giving you the most comfortable feeling for daily wear. Shiny rhinestones surface and high polish creates glamorous reflections and adds a luxurious look to this necklace. Clear glass double side face locket opens to add charms of your choice. Magnetic closure, easy to open and close. ★ A PERFECT GIFT SET: 1 * Floating Living Memory Locket Pendant + 1 * Top Quality Snake Chain + 2 * Delicate Plate + Full Set of 12 Simulated Birthstone Color Crystal Charms + Charms Set - All in an elegant jewelry gift box come with a beautiful greeting card which you can write a few words of sweetly blessing, No wrapping needed. Perfect gifts ideas for New Year, Party, Valentines Day, Christmas Day, Wedding, Graduation Gifts and Birthday gifts or Celebration gifts for Daughter. ★ SPECIFICATION: Floating locket pendant sizes: 30mm * 30mm * 7mm, Diameter: 30mm, Inner diameter: 23mm, come with a 55cm/21.6" snake chain + 5cm/2" Adjustable Chain, lobster claw clasp. Double side clear glass locket DIY pendant necklace open up to place image, photo, floating charms, pictures and plate to express your love for Daughter at any time. ★ SERVICE GUARANTEE: We offer a 100% satisfaction guarantee because customer first. Make sure you have Add this item to your Wish List to keep an eye on the latest BEFFY offers and promotions. If you have any questions about this product by Beffy, contact us by completing and submitting the form below. If you are looking for a specif part number, please include it with your message.